Nature walks are one of my favorite ways to get my kids outside. They are the perfect way to get your kids active, teach them something new, and open them up to conversation. I’ve been doing nature walks with them since my oldest son, now 18, was 5. I love nature walks because they can done anywhere at any time. You don’t need to go to a park; walking around your neighborhood will yield lots of things to look at and talk about. Always dress appropriately for the walk. During the summer, wear sunscreen, sturdy walking shoes, and a hat. If it’s too hot to wear long layers to protect against ticks, do a tick check at the end of your walk and another one at bedtime. Plan on setting aside at least an hour for the walk depending on the age of your kids. If you have little ones, check on conditions ahead of time. Some places have nice flat trails for jogging strollers while others may be a bit more rugged. When my guys were really little (under 6 months) I carried them in a Baby Bjorn. After 6 months we moved to the jogging stroller with a nifty little sack to keep them warm. To get started, take a walk in each of the different habits in your area. For example, our hometown area, the Delaware Valley, is home to a fresh water marsh, salt water marsh, meadows, mountains, and woods. The fresh water marsh is the source for walks throughout the year since it serves as a stopping point for birds migrating in the spring and fall. The other spots can be visited seasonally to see what changes have occurred. 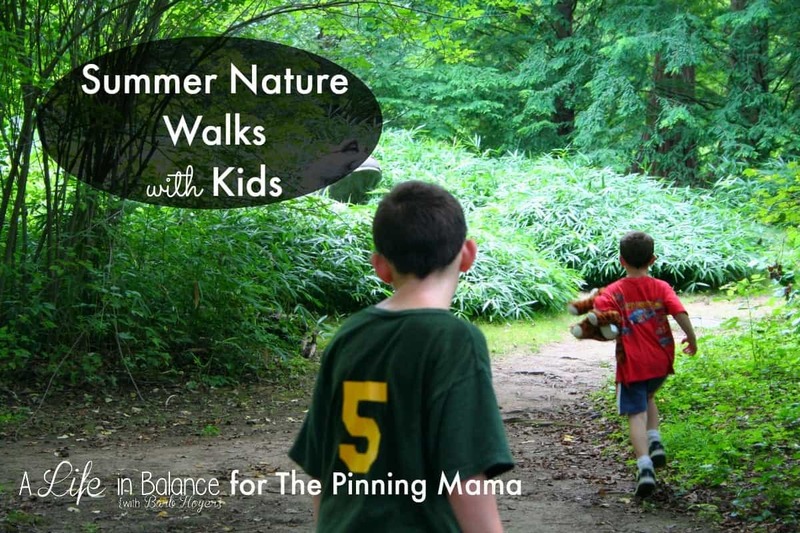 Nature walks are an easy learning opportunity. Just bring your own curiosity and encourage your kids to bring theirs. I have two favorite resources that I keep on my shelf. The first is Anna Comstock’s Handbook of Nature Study . Written in 1911, it is a wonderfully thick reference for those taking nature walks on the East Coast. Just be aware that it is a good size book. You may want to keep this in the stroller or at home. The second is Keeping a Nature Journal: Discover a Whole New Way of Seeing the World Around You by Claire Walker Leslie. Not only does it give a nice overview of how to draw, it gives ideas of what to look for in each season. I would love for my own nature journals to be as full of life as Leslie’s! I always bring an easy snack and water bottles when we go on our nature walks. Kids don’t need a big snack, though snack time is an easy way to take a rest. Often, when my kids are lagging and complaining about being tired, a quick snack stop gets them back into a happy mood, ready to head back to the car. My name is Barb, and I’m a mom of 5 kids, 4 boys and 1 girl. I share my life and resources for moms on my site A Life in Balance. You’ll find inspiration and motivation to balance parenting, fitness, real food, healthy living, and frugality. Remember, our lives are a journey. We’ll never have it all, or balance it all.